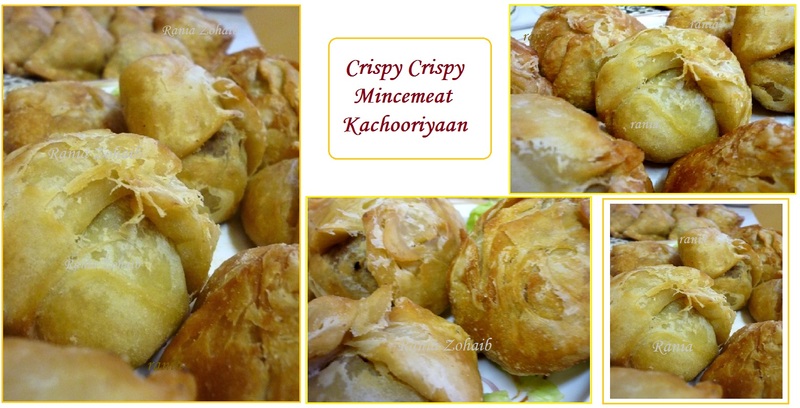 Kachori is a very popular spicy snack belonging to India. Basically stuffed with Daal or Vegetable. It's made of flour pastry fried into very crispy flaky balls. Of course with the time we have done many variations in the stuffing, it's the most eaten favorite snack in Lahore. This is another Chef Afzal Nizami recipe..
Knead a soft dough – it should be neither sticky nor hard. Soft and pliable. 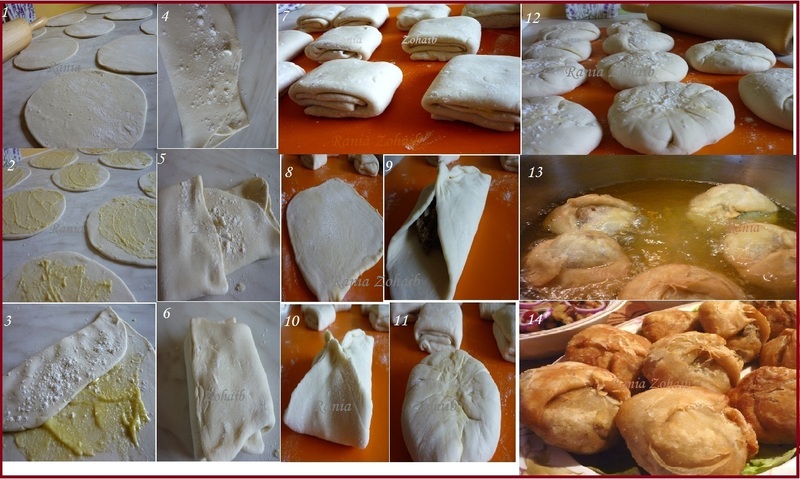 Cover and let rest for half an hour. Make small peras and cover. Let them rest. Fry 3 medium chopped onions in a little oil. Once the spices are mixed in, add ½ kilo mince meat. Sauté well and cover. Let it cook. Once done, let it cool down. Once completely cool, add a bunch of chopped mint. Mix 3 tbls flour with 6 tblsp ghee. The resulting ‘batter’ called ‘sandh’ should flow but not be thin. Roll out a small pera. Spread a tbls sandh over it. Fold over one side to half the rolled out pera. Apply a little sandh again, and fold the other side over it. Then fold from the sides, once from the right and once from the left. Make a small square. Cover and rest for 10 mins. Roll out the little square. Place 1 tbls filling in the center. Pick up the sides and hold together lengthwise. Pick up the ends and twist in the middle to ‘lock’ the kachori. Flatten it a bit, coat slightly in flour and rest covered. Heat oil in a karahi. Check if oil is hot enough by holding a wooden skewer in the middle. If bubbles form around it, its hot. Place the kachoris inside and let them cook.. The MOST important thing is, the heat must be LOW. When u put the kachoris in, the should just come to rest at the bottom. Once they cook from inside, they will float up. Then turn and fry golden... Drain in a sieve..